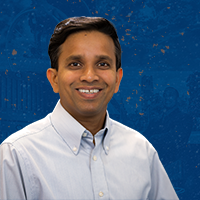 Prabhat Mishra, Ph.D., a professor at the UF Department of Computer & Information Science & Engineering, has been selected as a 2019 Herbert Wertheim College of Engineering Doctoral Dissertation Advisor/Mentoring Awardee. Mishra’s primary area of research is design and verification of architectures and algorithms for secure and energy-efficient electronic systems. Over the last academic year, he has mentored eight Ph.D. students and seven undergraduate researchers. Mishra said he guides students to choose a research topic based on their passion and educational background. He focuses on three core developmental aspects of each student: publication record, communication skills and research collaboration. According to Mishra, he sets the expectations upfront to solve only cutting-edge research problems and publish exclusively in top-tier international journals and conferences. The Doctoral Dissertation Advisor/Mentoring Award recognizes excellence, innovation and effectiveness in doctoral student advising and mentoring. Mishra will be formally acknowledged at the Spring Herbert Wertheim College of Engineering Awards Luncheon.